Wes Hollis is proprietor of Executive Cab. Age 65: 100, 5 hour shifts, or 500 total hours per year. Age 70: 50, 5 hour shifts, or 250 total hours per year. Age 75: Elimination of the driving requirement. There should be reduced driving requirements for owner /operators (affiliates), and for color scheme holders of small cab companies. 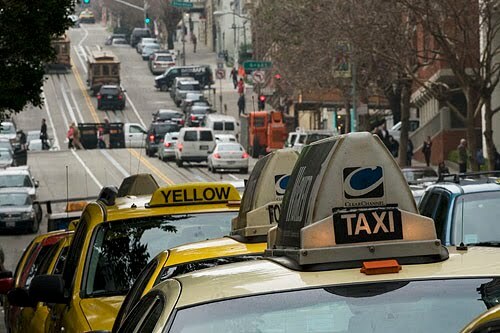 Affiliates, and color scheme holders of cab companies with 1 to 4 permits: 100, 5 hour shifts, or 500 total annual hours. Color scheme holders of cab companies with 5 to 9 permits: 50, 5 hour shifts, or 250 total annual hours. Find, pay for, equip, and paint the car. Get the car inspected and approved. Sell the car when it is retired from service. Handle, and pay for the annual meter inspection and GTU inspection. Pay the car's annual registration fee. Pay the car's liability and workers Comp insurance costs. Arrange for a towing service. Handle any accidents, from start to finish. Hire and manage lease drivers; handle any complaints about those drivers; keep personnel records on those drivers. Figure out ways to keep those drivers from quitting to go do a long-term lease. Handle lost & found items. Arrange, and pay for safe, off-street parking. Make copies of all waybills before turning them in at the cab company office. Maintain a monthly work log. Process credit cards, and deal with credit card issues. He has to frequently drop whatever he is doing, and go drive the cab himself, when a lease driver calls in sick. Weekly cleaning of the cab's interior (because lease drivers never do a thorough job of it). Find the best prices for parts, supplies and repair work. Handle all of the maintenance and repairs on the cab. Keep tools and supplies on hand for doing mechanical and electrical repairs. gear oil, anti-freeze, WD-40, filters, spark plugs, spark plug coils, light bulbs, battery, jumper cables, battery tester, brake pads, rotors, tires, an extra wheel with the tire already mounted, rolling jack, lug nuts, tire air pressure sensor, etc., etc. Pay any fines for his lease drivers' misdeeds or screw-ups. Interact with both cab company management and MTA on compliance issues. Most all of the things listed above require attendant paperwork and recordkeeping in addition to the actual physical act itself. At an absolute minimum, an owner / operator (affiliate), spends at least 10 hours per week on management functions. And that's when everything is going right. That is, no flat tires, dead battery, accidents, other mechanical or electrical problems, no driver complaints. Affiliates most assuredly earn the right to expect a significantly reduced driving requirement. Requires all pre-prop K permit holders to sell their permit when they reach 80 years old? Forbids the sale of a permit to anyone over 75 years old? That restricts any permit purchaser over the age of 70 to only operating that permit as a gas & and gates permit? A final evaluation of the permit sales pilot program be held off until all 60 purchasers have had their permit for at least six months. Then investigate them financially to see how many have maxed out their credit cards doing cash advances, or worse still, gone to loan sharks, just to stay current with their permit mortgage payments. I'm suggesting the non-invasive investigating technique of 10 minute, one-on-one interviews with the permit holders to "see how it is going". Additionally, how many have been late with their monthly mortgage payments, or have outright defaulted on their payments.